It’s now January, though—that month in which everyone makes a resolution to be kind to their bodies by shedding a few pounds and eating better. So, here’s a recipe to get you started. 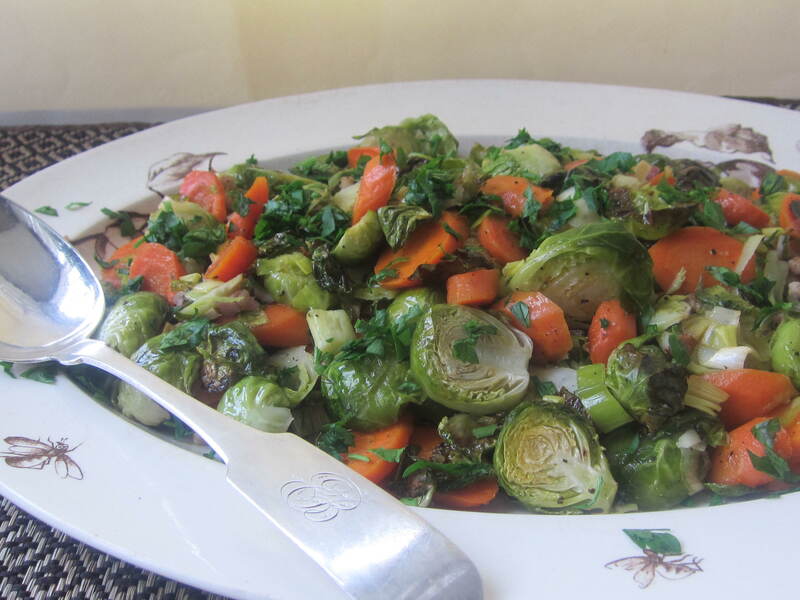 Brussels sprouts, carrots, and leeks are coated with some olive oil and then roasted until just slightly browned and tender. A small addition of diced pancetta provides a robust and indulgent accent. This recipe is based on one my friend and talented assistant, Emily Bell, served while I was visiting her in Ohio. She used parsnips in her version, and I replaced them with carrots for a shot of color. Serve this delectable winter side with a-roast chicken or a pork tenderloin, and don’t be surprised if you find your family and friends asking for seconds of the vegetables. 1. Arrange a rack at center position and preheat oven to 350 degrees F. Use 2 tablespoons of the oil to grease a large rimmed baking sheet. 2. Cut off and discard bases (root ends) of the Brussels sprouts. Then lay a sprout on a work surface and cut lengthwise through the root ends into 4 slices. The slices should be about the size of a quarter or slightly larger. 3. Cut the carrots into 1/4 inch thick slices. If the carrots are not slender, halve them lengthwise, and then slice. 4. Spread the sliced sprouts and carrots on the baking sheet. Sprinkle the leeks and pancetta over them. Toss the vegetables with 2 to 3 tablespoons additional oil (enough to coat them generously). Sprinkle with 1/2 teaspoon salt and several grinds of pepper. 5. Roast, stirring once or twice, until vegetables are tender and just slightly browned, about 25 minutes or more. Watch carefully so the vegetables do not burn. Remove and season with more salt if needed. Mound vegetables on a platter or in a shallow serving bowl. 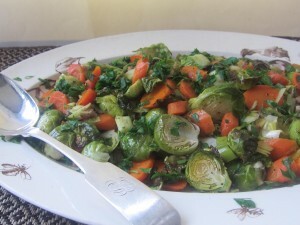 This entry was posted in 2012 Recipes, Market to Table, Recipes, Side Dishes and tagged Brussels sprouts, healttyh, pancetta by brosbottom. Bookmark the permalink.